Emerging evidence indicates that bromodomains comprise a conserved class of epigenome readers involved in cancer development and inflammation. Bromodomains are associated with epigenetic modifications of gene transcription through interactions with lysine residues of histone tails. Particularly, the bromodomain and extra-terminal domain (BET) family member BRD4 has been found to be involved in the control over oncogenes, including c-MYC, and in the maintenance of downstream inflammatory processes. 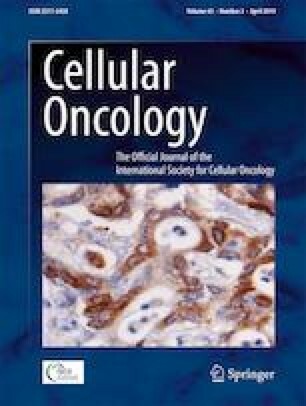 The objective of this study was to evaluate the effect of pharmacologically displacing BRD4 in mucoepidermoid carcinoma (MEC) cells. We assessed the presence of BRD4 levels in a panel of human MEC tissue samples in conjunction with histological grading and clinical information. In vitro studies were carried out using human MEC-derived cell lines. The BET inhibitor iBET762 was administered to MEC cells to assess the impact of disrupted BRD4 signaling on colony forming capacities and cell cycle status. The activation of cellular senescence induced by iBET762 was determined by immunohistochemical staining for p16ink4. Flow cytometry was used to identify populations of cancer stem cells in MEC-derived cell lines. We found that primary human MECs and MEC-derived cell lines are endowed with high BRD4 expression levels compared to those in normal salivary glands. We also found that, by displacing BRD4 from chromatin using the BET inhibitor iBET762, MEC cells lose their colony forming capacities and undergo G1 cell cycle arrest and senescence. Finally, we found that targeted displacement of BRD4 from chromatin results in depletion of cancer stem cells from the overall MEC cell populations. Our findings indicate that bromodomain-mediated gene regulation constitutes an epigenetic mechanism that is deregulated in MEC cells and that the use of BET inhibitors may serve as a feasible therapeutic strategy to manage MECs. This work was conducted during a visiting scholar period at the University of Michigan, sponsored by the Capes Foundation within the Ministry of Education, Brazil (grant n. BEX / 88881.132606/2016-01 PDSE). This grant was funded by a University of Michigan School of Dentistry faculty grant, and a Cancer Center Support Grant (P30 CA046592). The authors declare no potential conflicts of interest with respect to authorships and/or publication of this article. RLM performed most of the cell culture-based assays, IHC, IF, and participated in the organization of the figures. CHVNF performed the flow cytometry assays, LAR helped with the IHC and IF assays, and LPW helped with the immunofluorescence assays and its quantifications. VZ and MDM contributed to the collection of MEC tissue samples and their clinical data and helped with their re-evaluation. PAV, MAL, CHS and RMC contributed to the conception, design, data organization and writing of the manuscript. All authors gave their final approval and agreed to be accountable for all aspects of the work. Springer Nature remains neutral with regard to jurisdiction-al claims in published maps and institutional affiliations.